Do you see yourself having a future behind the camera, whether as a Hollywood film or television director, an independent auteur, or a music video director? 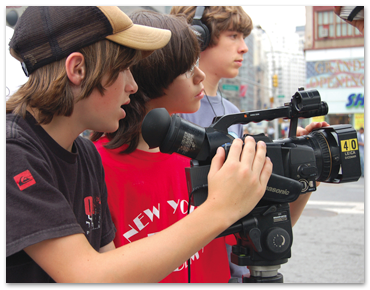 Whether already shooting films in your free time or eager to get some real hands-on experience, the New York Film Academy offers a wide variety of filmmaking camps for tweens and high school students with little or no experience that will immerse you in the world of filmmaking. Across all of our filmmaking camps, every student will write, shoot, direct, and edit his or her own film because at the Film Academy, we believe that to become a successful filmmaker, one must learn by doing. Directing: Students are educated and gain experience in the language and practice of visual storytelling. Writing: The foundation for any film, students learn to develop a story from an idea through to treatment and outline and ultimately to a completed shooting script. 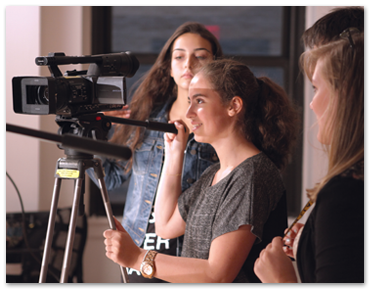 Hands-On Camera: Depending on the camp they are enrolled in, students will be taught how to use the Arriflex 16-S and/or the 24P digital video camera along with correct loading, operating, and maintenance of the equipment. Editing: An art unto itself, faculty will instruct students in how to edit their films using digital editing software. Students learn not just the technical basics of film editing, but also the principles and theory that inform editing philosophy and styles. For students who have completed either our 3 or 4-Week Filmmaking, 3 or 4-Week Digital Filmmaking,or 6-Week Film and Digital Filmmaking Camp or a comparable program, the 6-Week HD Filmmaking Camp will see students directing and editing an original short film of six to eight minutes with the use of a high definition camera. Prior to enrolling in the camp, students will first compose a short script as the focus of this camp is learning the hands-on fundamentals of High Definition filmmaking. Students will take hands-on classes in camera, lighting, sound, directing, and editing in order to discover the potential and qualities of HD and adequately train them to shoot their own original shorts. This camp is offered in both Los Angeles and New York City. An intensive introduction into the art of filmmaking, this 6-Week Filmmaking Camp provides students with hands-on instruction in 16mm and HD digital video, giving them the chance to write, direct, shoot, and edit four short film projects using Arriflex 16-S cameras, Lowel lighting packages, and digital editing software. Classes will include hands-on training in directing, writing, editing, cinematography, and production in order to educate students in all aspects of visual story telling. The six-week camp draws a student body from all over the world, giving aspiring filmmakers the chance to work with others from a variety of background in a diverse set of locales that includes New York City, Los Angeles, Harvard University, Florence, Italy, Paris, France, and Disney Studios. One of the most popular filmmaking camps offered by the Film Academy, our 4-Week Film Camp offers students a hands-on introduction to the fundamentals of filmmaking. Students will complete three short film projects that increase in difficulty, spending half of their weekdays in class and the other shooting their films with each student writing, directing, shooting, and editing using Arriflex S 16mm cameras, Lowel lighting packages, and digital editing software. Weekends are spent writing, relaxing, and going on organized trips and activities. The camp is offered in New York City, Los Angeles, Harvard University, Florence, Italy, and Paris, France. For students who have completed either our 3 or 4-Week Filmmaking, 3 or 4-Week Digital Filmmaking, or 6-Week Film and Digital Filmmaking Camp or a comparable program, the 4-Week Advanced HD Filmmaking Camp gives students the chance to go further in their own filmmaking by directing and editing a short 4-6 minute film. Prior to enrolling, students must provide a short script of three to six pages that they will transform into their short film using the Canon 5D Mark II camera. Advanced camera, sound, lighting and grip equipment will be introduced that is not used in the introductory camps, helping students to develop their technical and storytelling skills. 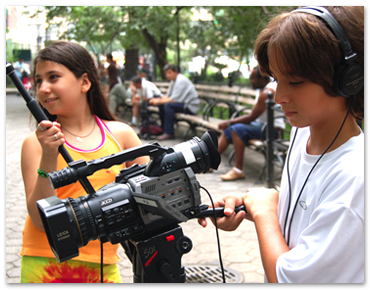 An intensive hands-on summer camp, the 4-Week Digital Filmmaking Camp gives students the chance to direct three projects on HD video format using HD digital cameras and edit their projects using digital editing software. This filmmaking camp is tailored towards the art of digital filmmaking ranging from digital directing to digital camera and lighting. Film school condensed to its essentials, the 3-Week Filmmaking Camp is focused around the creation of two short films, with students working in four person crews on each other’s projects while also writing, directing, shooting and editing their own films. Hands-on classes include introducing students to the art of directing, writing, editing, cinematography and production in order to give them a foundation in the creative and technical requirements of filmmaking. For students who have completed either our 3 or 4-Week Filmmaking, 3 or 4-Week Digital Filmmaking,or 6-Week Film and Digital Filmmaking Camp or a comparable program, the 3-Week Advanced Filmmaking Camp will develop students’ creative and technical skills, with each one directing and editing a short 2-4 minute film, having submitted a brief script of three to six pages before starting. Classes will include hands-on instruction in camera, lighting, sound, directing, and editing in order to best understand the Canon 5D Mark II camera while also preparing them for short film. In addition, students will also participate in Production Workshop classes where they engage in camera and lighting tests before going into production during the third week of the filmmaking camp. Providing students with the opportunity to engage every dimension of the filmmaking process in a short period of time, the 3-Week Digital Filmmaking Camp will have students shoot two short films using HD digital video cameras, with the films being screened and critiqued as they are completed. Students will learn the ins-and-outs of digital filmmaking and how this format effects everything from directing to lighting. Students literally live filmmaking in the Film Academy’s 1-Week Digital Filmmaking Camp, providing them with the unique opportunity to gain experience in writing, directing, shooting, and editing for film while shooting using HD digital video cameras and digital editing software. A great opportunity for students to introduce themselves to the world of film, this accelerated filmmaking camp will culminate in each student creating a short exercise that will be screened at the end of the week. A medium that is unique unto itself, music video is one of the most immediate ways for people to enter into the greater world of filmmaking. Accordingly, the 1-Week Music Video Camp will immerse students in the world of music video through hands-on learning with instructors who are professional music video directors and will guide pupils through every facet of the music video process. The camp will culminate in each student shooting and editing his or her own short music video subject by either working with an emerging band or artist or creating stylized footage for a published song. A fantastic opportunity for high school students to learn filmmaking during the school year at our New York and Los Angeles camps, the 12-Weekend Digital Filmmaking Camp allows students to work with faculty and each other over the course of twelve consecutive Saturdays to create their own short films of up to three minutes. Like our other camps, students will have the opportunity to write, shoot, direct, and edit a film project while also assisting in their classmates’ own productions as members of a film crew. Students will shoot on HD digital video cameras while learning composition, direction, and how to light their films, along with editing on digital editing software stations. Designed for young people ages ten to thirteen, the Film Academy’s Kids Film Camp allows students to write, direct, and edit his or her own short film while also working on classmates’ projects as crew members. Over a one- or two-week period, students will learn to shoot on digital video cameras and edit using digital editing software. A one-of-it-kind opportunity, this filmmaking camp is a great way to introduce young students into the world of filmmaking, either providing them with a useful set of skills or inspiring them to pursue film further.